Last week, Prime Minister Narendra Modi met senior finance ministry officials and got aware of rising bad loans at state-run banks. 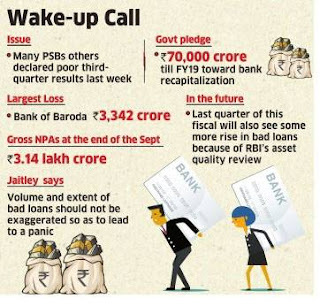 Some of these banks have announced that they could not get desired third-quarter results because they were pushed by RBI to set aside money so that bad loans can be covered and their books can be cleaned up. "The prime minister was apprised of the situation. It is not that grave as it is made out to be," a senior government official told ET. "We are hopeful that as the bankruptcy law gets passed, financial institutions will have more teeth to rein in defaulters." Capital requirements of state-run banks and the impact of bad loans on their profitability were also the topics of discussion in the meeting. "The government is committed to adequately capitalise PSBs (public sector banks)," he said. "It is expected that the last quarter of this fiscal will also see some more rise in bad loans because of Reserve Bank of India's asset quality review (AQR)."